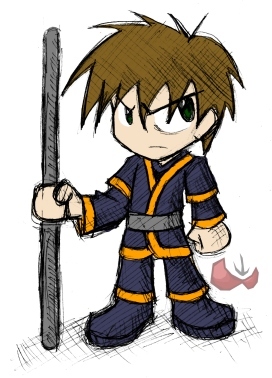 Xgoff, drawn by FuPoo (now outdated). Xgoff is an MFGGer known for his consistent laziness and inability to finish what he starts, especially fangames or other large projects. This is accompanied by his compulsive archival habits; he easily fills his hard drive not with large videos or new games, but with files ranging from 1 to 10 years old. His typing style is somewhat complex, usually lacking capitalization and punctuation, though he is very particular about spelling and other grammar rules; other members usually do not have problems understanding him. Despite many of his posts being heavily sarcastic, some newer members completely miss this and take him seriously; older members are frequently seen pointing out said sarcasm. Xgoff is quite experienced with Clickteam products (having used them since 2001), and uses MMF2 as his main program, though he will occasionally revert to MMF1.5 for some projects. Prior to using said products, he had used ZZT and Megazeux; his first and only completed fangame so far was made in ZZT. SMB3D - A "3D" version of SMB3, never completed due to issues with MMF's OpenGL X object. However, Xgoff has recently completed a working rendering engine that is equivalent to what this game would have used. It is unknown if this game will be attempted again. SM2L - A game that would have similar gameplay mechanics to Wario Land for Nintendo's Virtual Boy, never completed due to the large number of active objects required for scrolling. This project may be revisited with MMF2, though this is extremely unlikely. SMB3D:2L - This is a jest. However, this would solve the SM2L problem had said problem not been solved with MMF2. ROTSR - Involved the use of the Star Rod and its many abilities. Many ideas used in this game would have been used for Mario: Revolution, and in fact this game would have been much the same as Revolution but in a lighter tone. Mario: Revolution - A darker, more realistic interpretation of the Mario universe that met its demise as a result of the immense amount of work required even to begin the project, much less work on it. MPUZ - A puzzle-type game that Xgoff may have a slight chance of finishing. In terms of gameplay, it contains the standard level objects and enemies from classic Mario platformers, among some extras. It is notable for being one of the few fangames that provides a level editor and otherwise makes extensive use of external files, and will use Lua as a means of controlling most objects and enemies. COSINE - Experimental Lua-based general Mario engine for MMF2, which may be Xgoff's next project after MPUZ, unless he somehow becomes inspired enough to start Mario: Revolution again. Fire Emblem Online - A group project for the MFGG community possibly scrapped. Losenge - Improv Game Contest #2 winner. The object was to avoid the word "Losenge" for as long as you can, The problem henceforth that one is constantly bouncing, and there are platforms that make you bounce even higher; these can help or hinder you. Losenge: Super Ac!d Trip Version (Losenge 1.5) - A remake of the original Losenge in MMF2. It is notably more difficult than the first, due to the platforms and Losenge being more dependent on the player's score for their movement speed. Also increasing the difficulty is the inclusion of motion trails on moving objects, which prove to be highly distracting; especially at high speeds. Losenge 2 - Never released. Different modes of gameplay available. File corrupted for unknown reasons. Untitled - Mario-based Losenge game, but with different enemies and powerups available. For all intents and purposes it will be replaced by MPUZ. Soveryseizure - Improv. Game Contest #1 entrant. Usage of the Palette Object caused not-so-slight problems with ShadowMan's computer, related to which the administrator showed great anger. SMB3 Leaf Engine - First attempt by Xgoff at creating a Raccoon Suit engine. As a result, it was plagued with many bugs, not the least of which was the tendency for Mario to run in mid-air. SMB3 Complete How-to - This has never been shown to the public and is never intended to be, mainly because it was never finished. It is unknown why it is listed in this category. MFGG group picture - Self-explanatory. This offer may appear again in one form or another, but the chances of this happening are quite unlikely. Xgoff was an avid user of ZZT a few years ago during its peak in popularity. However he only completed one game. Mario's Pitiful Adventure - Pitiful indeed. The only finished ZZT game by Xgoff, which showed great console-based bias. One was to defeat Bill Gates, destroy the X-boxes and save the Golden Gamecube and the Princess. Fortunately Xgoff is now much more tolerant about X-boxes. This game holds the record for being Xgoff's first and only finished fangame. Mario's Pitiful Adventure 2 - There was no MPA2; it was the name of MPA3's remake after numerous file corruptions. Mario's Pitiful Adventure 3 - Super Mario World 3: Mario's Pitiful Adventure 3 continues the story of MPA1. This installment was not so pitiful, in fact it had effort put into it. Therefore, it is no surprise to note it was corrupted. The main feature of the game would have been the inclusion of "suits", which would allow the player to be disguised as another character to gain access to certain areas. Xcross - A Picross game made by Xgoff due to sheer boredom. During the time of development, Xgoff didn't know some of Picross's smaller rules involving picture design, so the grid is 16 x 16 instead of the more standard 15 x 15. Also included with the program is an editor for users to create their own puzzles. Tileset Splitter - A program designed to split tilesets (or really any image) into rectangles up to 128 by 128 pixels, with changeable spacing and initial offset. Currently only version 1.0 has been released; version 2.0 will allow for other features such as array-based ripping and variable rectangle and spacing sizes, along with support for transparent PNG export. Awesome Games Series - A set of intentionally horrible minigames, ranging from easy to literally impossible (without cheating). Five games make up the set, though it's possible that Xgoff will expand the Series in the future. Clone of Wii Play's Tanks! Xgoff first found MFGG through a link posted on YBK (a Banjo-Kazooie fansite/forum), and joined the vBulletin forums about a year later in mid-2003, as SuperMetalMario. Not long after, the KPP incident erupted, and Xgoff managed to become labeled as being "related" to KPP, causing many members to distrust him. As a result, his activity dropped significantly, even after the Invision forum was launched. However, he became more active as time went on; his "connections" with KPP were becoming obviously false to those who suspected him. Before long, Xgoff started getting more into Mario fangaming, which he had a slight interest in even before knowing about MFGG. His first few ideas were abysmal, though he finally struck gold with Super Mario: 2-Layer. However, his lack of experience with MMF at the time, along with program limitations itself, led to the abandonment of the project. His next attempt was Return of the Star Rod, a game loosely based on the events of Paper Mario. Again, this project was canned. A few more ideas surfaced, but none of them made it past early stages of development. It would not be until 2 years later that Xgoff would announce another project. In the meantime, Xgoff would complete smaller projects, the first of which was an entry for Improv Game Contest 1. Unfortunately, complications with the game itself caused major problems with ShadowMan's computer, enraging him. News of the problem was forwarded by ShadowMan's brother, Parakarry; hints about banning were given, though in the end, Xgoff was only warned as it was shown the event was an accident, and that no permanent damage was done. Of course, many members became wary of Xgoff's programs for a short time. Xgoff entered the second IGC despite the wariness, and surprisingly, his Losenge game won the competition by a fair margin. Throughout the next few years, Xgoff focused more on application development than game development. The first few of these were "mini" apps designed to make certain Invision text effects easier to perform, such as reversed text or text size that changes along a sine wave. He later coded the Ownage Generator, which allows a person to designate an "Owner" and an "Ownee", and a Half-Life 2 item for the former to "own" the latter; it exported an image similar to the death messages used in Garry's Mod. Another inherently useless program was Quadbrowser Deluxe, an internet browser that could display 4 different pages at once. However, he has developed and released more useful programs, some of these are: a Super Mario Kart track designer, a Picross clone, and Tileset Splitter 1.0. Eventually, Xgoff unveiled another fangame project: Mario: Revolution. Unlike the vast majority of Mario fangames, it was much darker and "mature". Again, this project fell into periods of inactivity before being canned altogether shortly after the announcement of MPUZ. Now 2006, Xgoff was determined to finish a fangame, and opted to attempt something that wouldn't require as much time and effort as a full game. He revealed MPUZ, a puzzle-based game, which by nature did not require much of a story or plot. However, what he intended to be a simple project evolved into something much more complex after 2 years. Now known as MPUZ Revolution (as it was essentially half-M:R), it was given an actual plot, and now MPUZ is far more complex than it was when it began. Currently it is still in progress with no plans on being canceled. Xgoff would later develop and release the Awesome Games Series, intentionally poor "minigames" with little to no actual plot. Apart from Mario's Pitiful Adventure, these are the only other fangames Xgoff has completed. Like many others, Xgoff has noticed and criticized the apparent decline of the forums, and will often actively partake in discussions about "rebuilding" the forum. He hated how the PPP was abused, and would often suggest that it either be replaced entirely or supplemented with a forum that still allowed off-topic discussion, but restricted stupidity. This was eventually done with the CCC. He has a very absurdist sense of humor, though not absurdist beliefs. Xgoff does not like roleplay, and his character mostly exists as a way to participate in events like FIFAD, though he is planning on using his character for other projects. Though he has completed 6 fangames, he only acknowledges Mario's Pitiful Adventure as complete enough to qualify, though it is still extremely short. Oh and it's the only one that has effort put into it. This page was last edited on 2 May 2015, at 22:34.